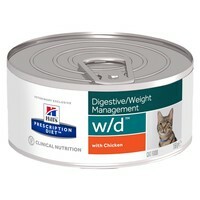 Hills Prescription Diet WD Digestive/Weight Management is a nutritionally complete diet for the management of obese or overweight cats. Some cats are more prone to weight gain than others, and just a bit of extra weight can have a serious effect on their health and energy levels. Daily use of Hills W/D will reduce these risks by helping your cat maintain lean muscle mass, metabolise fat and providing them with all the nutrition they need as they lose and maintain weight.